One of media’s most enduring broadcasters, Emmy and Peabody Award-winning journalist Geraldo Rivera is a Fox News Senior Correspondent and host of breaking news specials, the “Geraldo Rivera Reports.” He is a rotating co-host on the FOX News Channel's hit program The Five (weekdays 5-6PM/ET) and provides regular reports and commentary on FNC's Fox and Friends, Hannity, The Kelly File and The O’Reilly Factor. He joined the network in 2001 as a war correspondent following the 9/11 attacks. Most recently, Rivera reported from Charleston, SC on the horrific, racially-motivated massacre in the Emanuel African Methodist Episcopal Church, and on the riots that followed the death in police custody of Freddie Gray in Baltimore, MD. Deeply engaged in reporting the recent spike in urban violence, Rivera provided live coverage of the funeral of the fallen NYPD officers, Wenjian Liu, Raphel Ramos and Brian Moore. Additionally, Geraldo recently hosted hour-long specials, exposing the cushy life in prison of condemned killer Scott Peterson, the 35th anniversary of the overdose death of Elvis Presley, and on the untimely death of his longtime friend, comedian Joan Rivers. In 2009, Geraldo secured an exclusive interview with Joe Jackson, just after the death of his son Michael. Geraldo had previously interviewed the late Michael Jackson on the evening before his 2005 trial and acquittal for child molestations charges. Rivera also took part in extensive coverage of the Minneapolis bridge collapse and the aftermath of Hurricane Katrina and on many other natural and man-made disasters. A native New Yorker outraged by the terror attacks of 9/11/01, Geraldo took a major pay cut and left CNBC’s “Rivera Live” to become a FNC senior war correspondent, providing weeks of dramatic live reports from Tora Bora, Afghanistan during the initial siege on Osama Bin Laden’s hideout. Geraldo returned to Afghanistan ten more times to cover Operation Enduring Freedom and later traveled to Bethlehem to cover the Israeli-Palestinian conflict live from the Church of the Nativity siege in Bethlehem. He also covered the Iraqi elections from Baghdad and did a total of eleven extended assignment in Iraq, riding out of the country on what all expected would be America’s last military convoy leaving Iraq in 2011. One of his favorite live television moments came on the May 1st 2011 when Rivera anchored FNC’s coverage of the successful raid that took down Osama bin Laden. Rivera began his 45-year career as a television reporter at WABC-TV in New York where he presented a series exposing the deplorable conditions at the Willowbrook State School for the population then described as mentally retarded. These historic reports are credited with ending America’s policy of institutionalizing the developmentally disabled, leading to government investigations, institutions across the nation being eventually shut down and the civilized world adopting small, community-based housing as an alternative. The subsequent sea change in the treatment of the mentally disabled is Geraldo’s most important contribution to the well-being of society. Before becoming a member of the original cast of ABC's "Good Morning America," Rivera presented the first television broadcast of the infamous Abraham Zapruder film of the assassination of President John Kennedy as host of ABC's "Good Night America." He then began an eight-year association with ABC's "20/20" as an investigative reporter. One of his hour-long reports, "The Elvis Cover-Up" was for more than two decades "20/20's" highest rated shows. 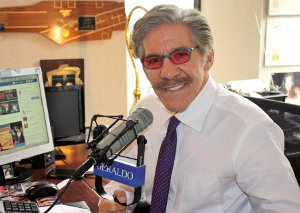 In 1987, Geraldo began producing and hosting "The Geraldo Rivera Show" for 11 years. In 1998, he hosted a series of investigative specials on NBC. Prior to joining Fox News, Rivera served as host of CNBC's number-one rated prime time show, "Rivera Live," where his critically-acclaimed coverage of the O.J. Simpson civil trial verdict set an all-time CNBC ratings record. An avid sailor who circumnavigated the globe, skippered four Marion to Bermuda races and took his boat “Voyager” 1,400 miles up the Amazon River, Rivera is a graduate of the University of Arizona and Brooklyn Law School and is the author of seven books, including two best sellers, “Exposing Myself” and “His panic.” He is a philanthropist who donates and raises millions to aid various causes including education and the care and treatment of the autistic. He is married to the former Erica Michelle Levy and has five children.